Vancouver was a smashing success! Good morning to all of you great people! I hope all is swell for you in Midwest( though I've seen it's raining and chilly there;() as it is for me here in the Western part of Canada! 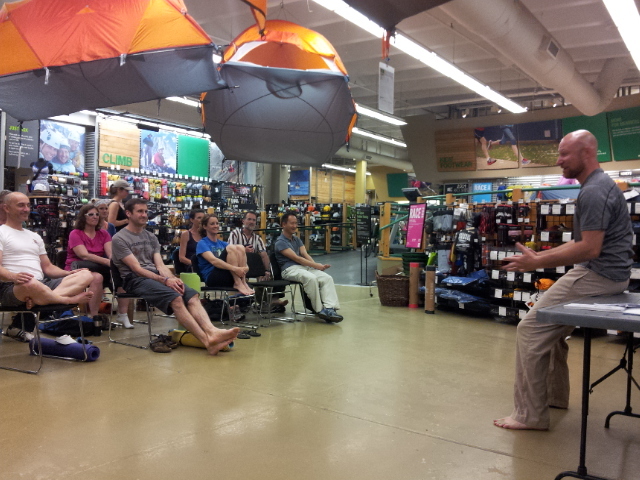 Last nights clinic at the MEC was AWESOME! There was a great turnout, a strong participation of our practice, and thoughtful questions from the class about how yoga can help them in their training. I feel so honored to be a resource for the people so far in Calgary and here in Vancouver. I can't wait for tonight!!! I had better get going so I won't miss the ferry to Victoria and the third clinic on this Canadian tour. A strong practice is of focus, dedication, and being present.